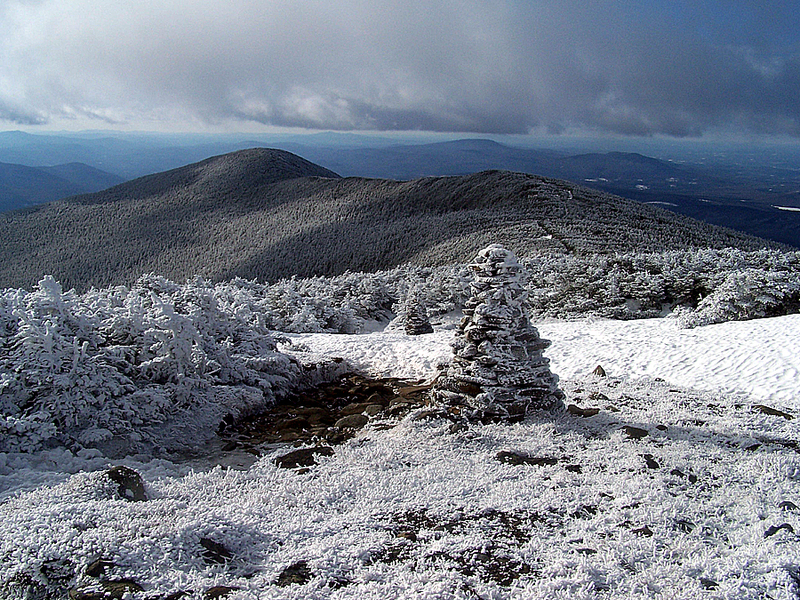 Mount Moosilauke is the western most 4,000 foot mountain in New Hampshire. It summit is above treeline and has excellent views in every direction, in bad weather caution should be used above treeline on the summit mass. Mount Moosilauke's Trails are all kept in excellent shape by the Dartmouth Outing Club. There are foundation remnants of an old stone hotel that used to sit atop the summit until it burned down in 1942. Beaver Brook Trail: 3.8 miles, elevation gain of 3,100 feet. The steepest and most fun approach to the summit of Mount Moosilauke off of Route 112 across from the southern terminus of the Kinsman Ridge Trail. The trail has moderate to steep grades with rough footing and some of the steeper rock pitches has re-bar to help you along the way. The trail passes by Beaver Brook Cascades and the Beaver Brook Shelter via a short side path. The last part of the trail is above treeline and exposed to the weather. Glencliff Trail (A.T.) / Moosilauke Carriage Road (A.T.): 3.9 miles, elevation gain of 3,300 feet. The Glencliff Trail has easy to moderate grades with good footing and is in the woods until reaching the Moosilauke Carriage Road just below the south summit of Moosilauke. From here the Moosilauke Carriage Road ascends to the main summit in 0.9 miles over easy grades with rocky footing. The trail is in the scrub and then above treeline with great views but extremely exposed to winds especially out of the west. Asquam-Ridge Trail: 3.9 miles, elevation gain of 1,750 feet, to summit via Beaver brook Trail 5.8 miles, elevation gain of 2,600 feet. The Asquam-Ridge Trail has easy to moderate grades the whole way. The start of the trail has been relocated since Hurricane Irene, it now starts at the end of Ravine Lodge Road at the turnaround. The lower section of the trail is eroded with rocks, roots, and mud but once past the Ace Merrill Loop junction the footing becomes much better as you ascend through pine and hardwoods. The trail never gets steep and is an easy climb to the Beaver Brook Trail.